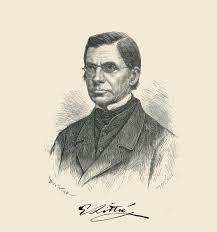 Today is the birthday (1779) of Peter Mark Roget FRS, noted popularly for the creation of the first thesaurus, but who spent most of his life as a physician, and published works in medicine and natural theology before he became a lexicographer. Roget was born in London. His obsession with list-making was well established by the time he was 8 years old. Roget was the son of a Swiss clergyman, and studied medicine at the University of Edinburgh, receiving his degree in 1798. His life was marked by several depressing incidents. His father and his wife died young, and his favorite maternal uncle, Sir Samuel Romilly, committed suicide in his presence. Romilly was distraught at the death of his wife, and in a fit of delirium he sprang from his bed and slashed his throat with a straight razor. Roget was powerless to save him. Subsequently, Roget struggled with depression for most of his life, presumably resulting from undiagnosed post-traumatic stress disorder, and his work on the thesaurus arose partly from an effort to battle his depression. Roget retired from professional life in 1840, and in about 1848 began preparing for publication the work that was to perpetuate his memory. For some reason he decided to build a catalogue of words organized by their meanings, starting in 1805. This was apparently an avocation bordering on obsession. I know how that goes. 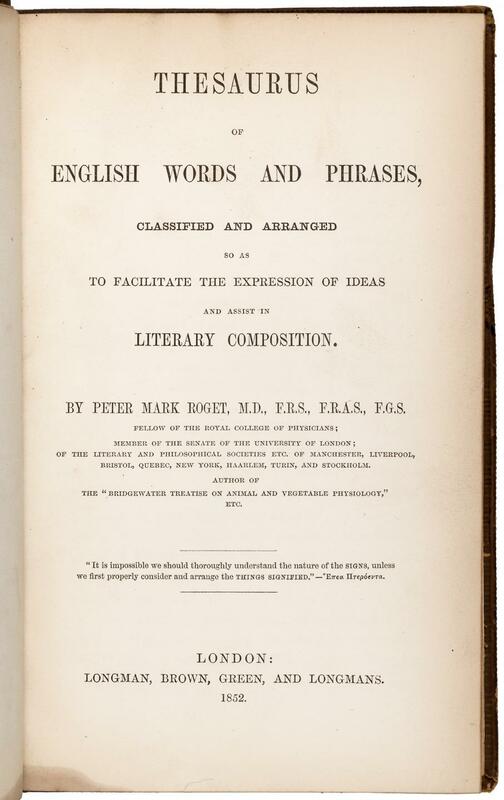 Its first printed edition, in 1852, was called Thesaurus of English Words and Phrases Classified and Arranged so as to Facilitate the Expression of Ideas and Assist in Literary Composition. During his lifetime the work had 28 printings. 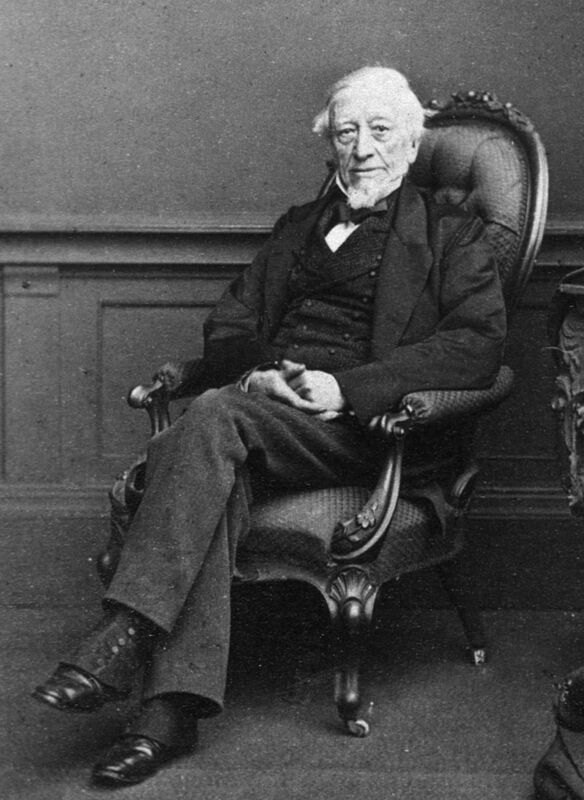 After his death it was revised and expanded by his son, John Lewis Roget (1828–1908), and later by John’s son, Samuel Romilly Roget (1875–1952). Roget was greatly concerned with medical education, but the School of Medicine at the University of Manchester was not established until 1874. He was also one of the founders of the Medical and Chirurgical Society of London, which later became the Royal Society of Medicine, and he was a secretary of the Royal Society. In 1815, he invented the log-log slide rule, allowing a person to perform exponential and root calculations simply. This was especially helpful for calculations involving fractional powers and roots. 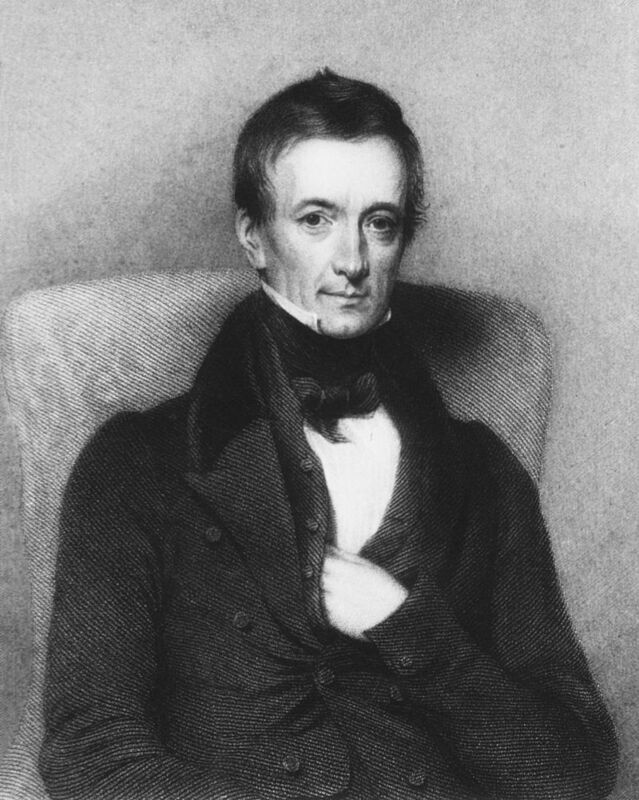 In 1834 he became the first Fullerian Professor of Physiology at the Royal Institution, and he was examiner in physiology in the University of London. On 9 December 1824, Roget presented a paper entitled “Explanation of an optical deception in the appearance of the spokes of a wheel when seen through vertical apertures.” This article is often incorrectly referenced as either “On the Persistence of Vision with Regard to Human Motion” or “Persistence of Vision with regard to Moving Objects,” likely due to erroneous citations by film historians Terry Ramsaye and Arthur Knight. 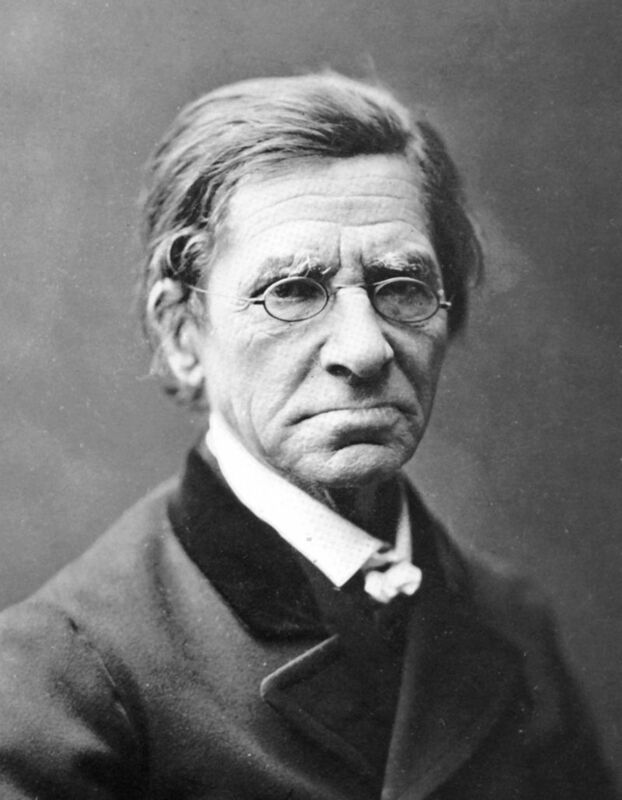 While Roget’s explanation of the illusion was probably wrong, his consideration of the illusion of motion is seen as an important point in the history of film, and possibly influenced the development of the Thaumatrope, the Phenakistiscope, and the Zoetrope. Roget also played a role in the establishment of the University of London. He was a founder of the Society for the Diffusion of Useful Knowledge, and wrote a series of popular manuals for it. He showed remarkable ingenuity in inventing and solving chess problems and designed an inexpensive pocket chessboard. Roget died while on holiday in West Malvern, Worcestershire, aged 90, and is buried there in the cemetery of St James’s Church. The word “thesaurus” in English originally meant a “treasure” or “storehouse,” but now it means a dictionary of synonyms due to Roget’s use of the word for his book. It can also be used figuratively as in a Cook’s Thesaurus where “synonyms” means “substitute ingredients.” Just as you can use “tome” or “volume” in place of “book” (under the right conditions), you can substitute spinach for cabbage (also under the right conditions). I have found this online cook’s thesaurus quite useful on occasion: http://www.foodsubs.com/ . As the URL suggests, the site is about finding substitutes for ingredients in recipes, and here I am of two minds. If I am making a gravy using Worcestershire sauce and I am out of it, I can’t make the gravy. There is no substitute for Worcestershire sauce. A cook’s thesaurus will tell me to substitute soy sauce, and I am sure the resulting gravy will be good, but it’s not what I want. I put cilantro in my guacamole, but if I don’t have cilantro, I can use parsley, but it will not be the same. I can also use lemon juice instead of lime juice. It will prevent the avocado from turning brown and will give a citrus tang, but it will not be the same. Longtime readers of this blog know that I am adamant about using indigenous ingredients wherever I am in the world. In Myanmar they use an aquatic species in the convolvulus genus, related to morning glory, called rwat, in many dishes. In English they call it watercress, but it is nothing like European watercress. Trying to make these dishes without rwat is a waste of time. All that said, there can be a great deal of creativity in changing one ingredient for another if you are not trying to make a dish in a particularly authentic or local way. A few posts ago I talked about taking the basic recipe for eggs Benedict and changing out one of the ingredients: http://www.bookofdaystales.com/benedict-arnold/ Now we are in vastly different territory. Substituting for the sake of novelty or creativity is a completely different ball game, and I’m down with it. A thesaurus for cooks is not the only tool in the box, but it’s a good start. Flour is an excellent place to start. There are many different types of wheat flour and replacing one with another can be great or can be dangerous. I’m talking about replacing wheat flour with flour from another grain, or even a non-grain. Here you do have to be very careful because things can go horribly wrong. But you can try barley flour or oat flour in bread, for example. Or you can be even more adventurous and use almond flour instead of wheat flour in cakes or pancakes. It’s not a bad idea to substitute half and half (half wheat flour, half other flour) first, to see how it goes. 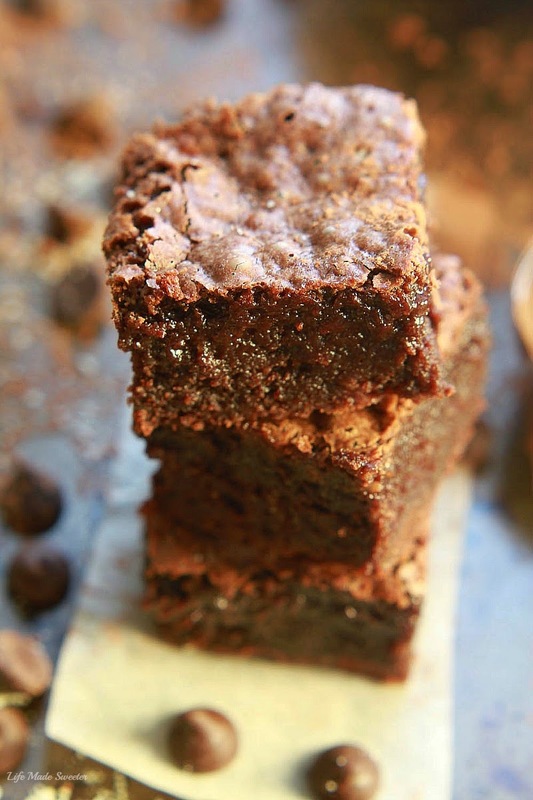 Here’s a recipe for almond flour brownies. It’s not just good for people with wheat allergies; it is delicious. The quality of the cocoa powder you use is very important; also the almond flour. I generally make my own, but it is easy to find in health food stores or online. Use butter to grease an 8″ square pan that is at least 2″ deep. Stir together the melted butter, sugar, salt, vanilla, cocoa, and eggs in a mixing bowl. Stir in the almond flour and baking powder, and mix well so that there are no dry pockets, but do not beat vigorously. Pour the batter into the prepared pan, using a spatula to make sure that it is spread evenly in the pan and the top is flat and smooth. Bake the brownies for about 35 minutes. 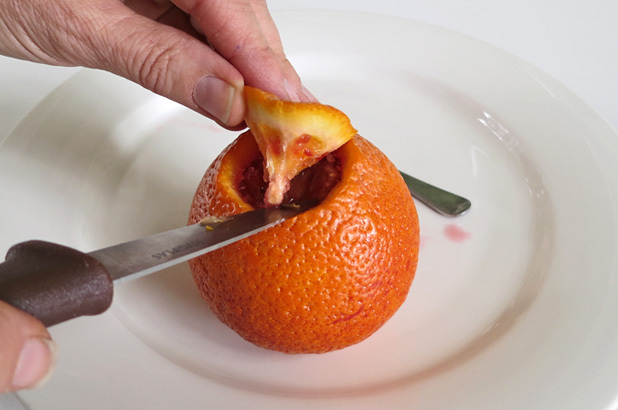 The top should be set, and a toothpick inserted in the center should come out clean. It is all right if the toothpick is a little moist or if there is a speck of chocolate at the edge. Let the brownies cool in the pan for about 15 minutes, then cut them into squares and serve immediately. If you are not ready to serve them straightaway, store them in an airtight tin at room temperature. They also freeze well. 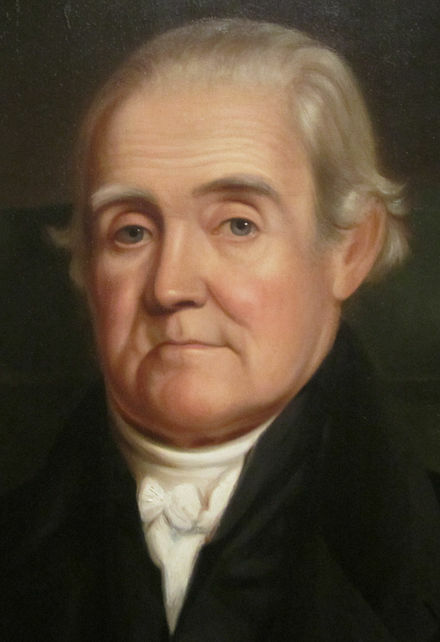 Today is the birthday (1758) of Noah Webster Jr., whose name is synonymous with “dictionary” in the United States, and who was a significant force both in primary education and in the development of what is now called American English. Many of the spellings now current in the US came from Webster’s crusade to simplify the complexities of British orthography, and also to distance the US from British habits. Webster was born in the Western Division of Hartford (which became West Hartford, Connecticut), to an established family. His father Noah Sr. (1722–1813) was a descendant of Connecticut Governor John Webster; his mother Mercy (Steele) Webster (1727–1794) was a descendant of Governor William Bradford of Plymouth Colony. His father was primarily a farmer, though he was also deacon of the local Congregational church, captain of the town’s militia, and a founder of a local book society (a precursor to the public library). After US independence, he was appointed a justice of the peace. Webster’s father never attended college, but he was intellectually curious and prized education. Webster’s mother spent long hours teaching her children spelling, mathematics, and music. At age 6, Webster began attending a dilapidated one-room primary school built by West Hartford’s Ecclesiastical Society. Years later, he described the teachers as the “dregs of humanity” and complained that the instruction was mainly in religion. Webster’s experiences there motivated him to improve the educational experience of future generations. At age 14, his church pastor began tutoring him in Latin and Greek to prepare him for entering Yale College. Webster enrolled at Yale just before his 16th birthday, studying during his senior year with Ezra Stiles, Yale’s president. His 4 years at Yale overlapped the American Revolutionary War, and Webster served in the Connecticut Militia. His father had mortgaged the farm to send Webster to Yale, but he was now on his own and had nothing more to do with his family. Webster lacked career plans after graduating from Yale in 1778, later writing that a liberal arts education “disqualifies a man for business.” He taught school briefly in Glastonbury, but the working conditions were harsh and the pay low. He quit to study law. While studying law under future U.S. Supreme Court Chief Justice Oliver Ellsworth, Webster also taught full-time in Hartford—which was grueling, and ultimately impossible to continue. He stopped studying law for a year and lapsed into a depression. But eventually he found another practicing attorney to tutor him. He completed his studies and passed the bar examination in 1781. He could not find work as a lawyer, but after receiving a master’s degree from Yale by giving an oral dissertation to the Yale graduating class, he opened a small private school in western Connecticut that was a success. Nevertheless, he soon closed it and left town, probably because of a failed romance. Turning to literary work as a way to overcome his losses and channel his ambitions, he began writing a series of well-received articles for a prominent New England newspaper justifying and praising the Revolution and arguing that the separation from Britain had to be permanent. He then founded a private school catering to wealthy parents in Goshen, New York and, by 1785, he had written his Speller, a grammar book and a reader for elementary schools. 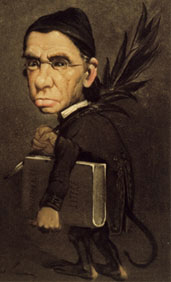 Proceeds from continuing sales of the popular “Blue-Backed Speller” enabled Webster to spend many years working on his dictionary. 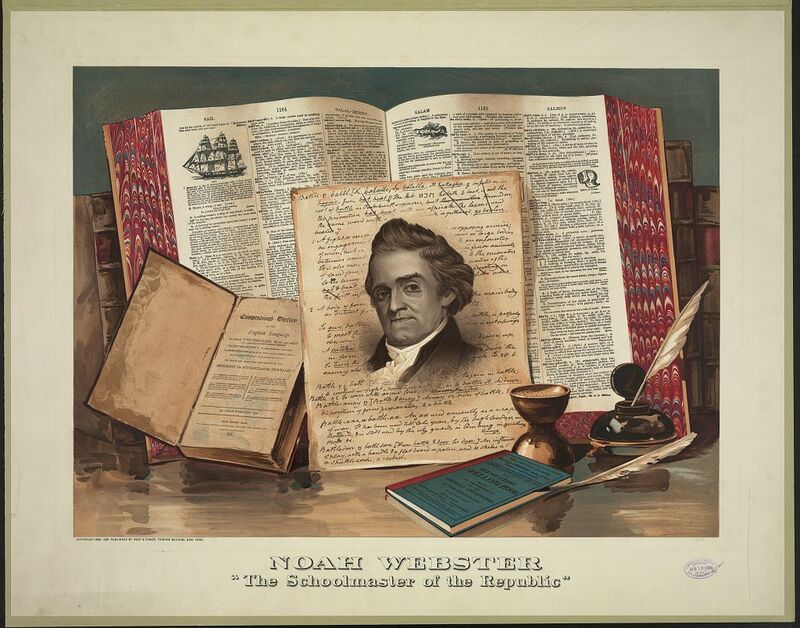 Webster saw his Speller and Dictionary as providing an intellectual foundation for American nationalism. As a teacher, he had come to dislike American elementary schools. They could be overcrowded, with up to 70 children of all ages crammed into one-room schoolhouses. They had poor, underpaid staff, no desks, and unsatisfactory textbooks that came from England. 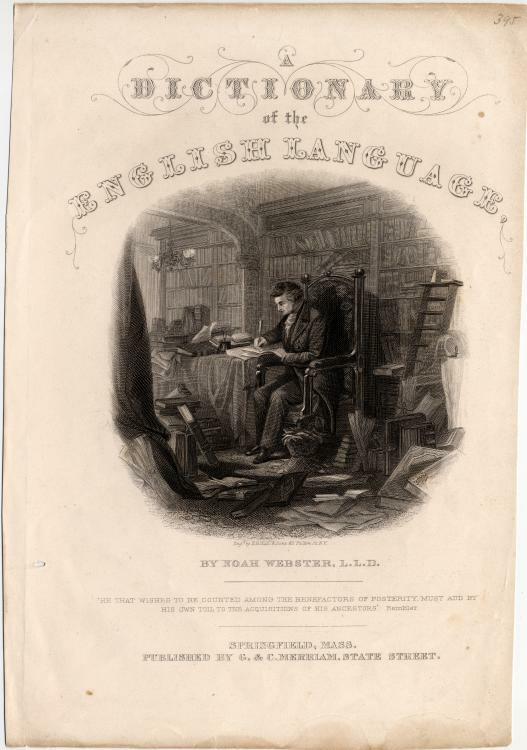 Webster thought that US students should learn from US books, so he began writing the three-volume compendium A Grammatical Institute of the English Language. The work consisted of a Speller (published in 1783), a Grammar (published in 1784), and a Reader (published in 1785). His goal was to provide a uniquely “American” approach to training children. His most important improvement, he claimed, was to rescue “our native tongue” from “the clamour of pedantry” that surrounded English grammar and pronunciation. He complained that the English language had been corrupted by the British aristocracy, which set its own standard for proper spelling and pronunciation. Webster rejected the notion that the study of Greek and Latin must precede the study of English grammar. 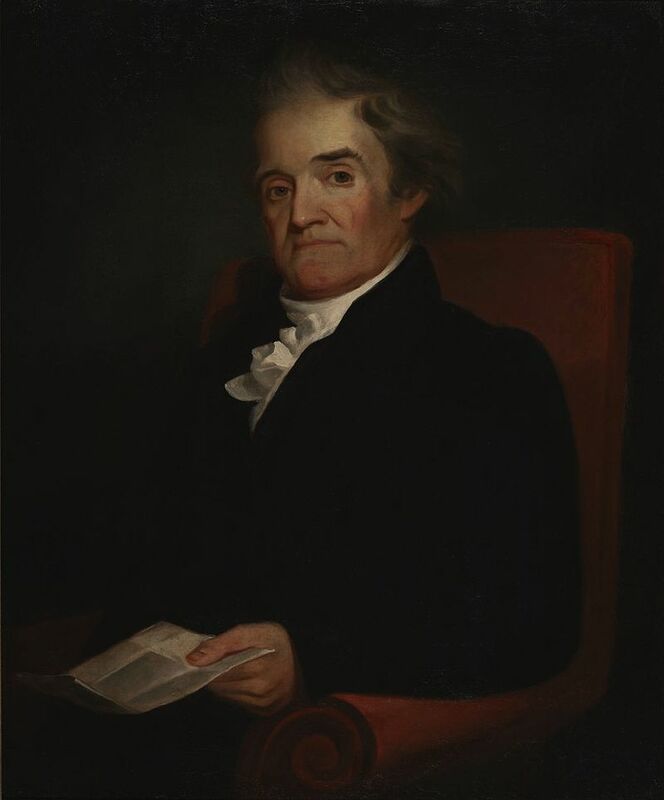 The appropriate standard for the American language, argued Webster, was “the same republican principles as American civil and ecclesiastical constitutions.” This meant that the people-at-large must control the language; popular sovereignty in government must be accompanied by popular usage in language. The Speller was arranged so that it was easy to teach to students, and it progressed by age. 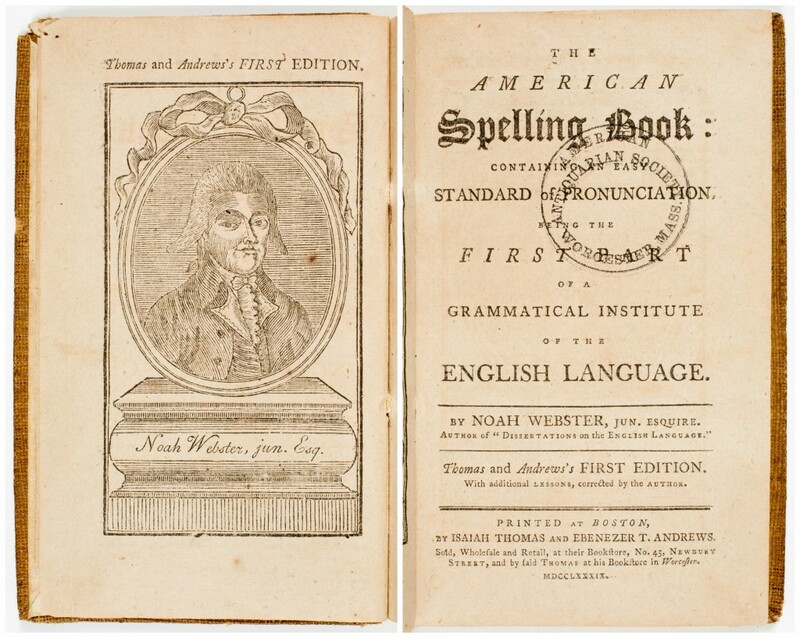 From his own experiences as a teacher, Webster thought that the Speller should be simple and give an orderly presentation of words and the rules of spelling and pronunciation. He believed that students learned most readily when he broke a complex problem into its component parts and had each pupil master one part before moving to the next. 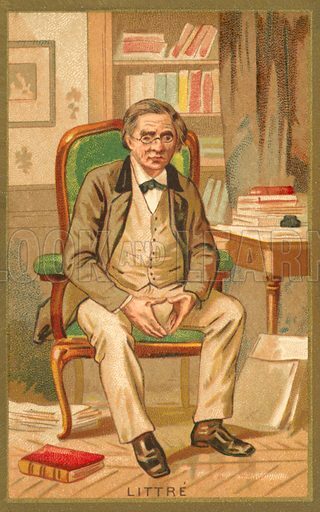 It has been argued that Webster anticipated some of the insights currently associated with Jean Piaget’s theory of cognitive development, although his inspiration on the matter came from Rousseau. Webster argued that children pass through distinctive learning phases in which they master increasingly complex or abstract tasks. Therefore, teachers must not try to teach a 3 year old how to read, but start at age 5. He organized his Speller accordingly, beginning with the alphabet and moving systematically through the different sounds of vowels and consonants, then syllables, then simple words, then more complex words, then sentences. The Speller was originally titled The First Part of the Grammatical Institute of the English Language. Over the course of 385 editions in his lifetime, the title was changed in 1786 to The American Spelling Book, and again in 1829 to The Elementary Spelling Book. Most people called it the “Blue-Backed Speller” because of its blue cover and, for the next 100 years, Webster’s book taught children how to read, spell, and pronounce words. 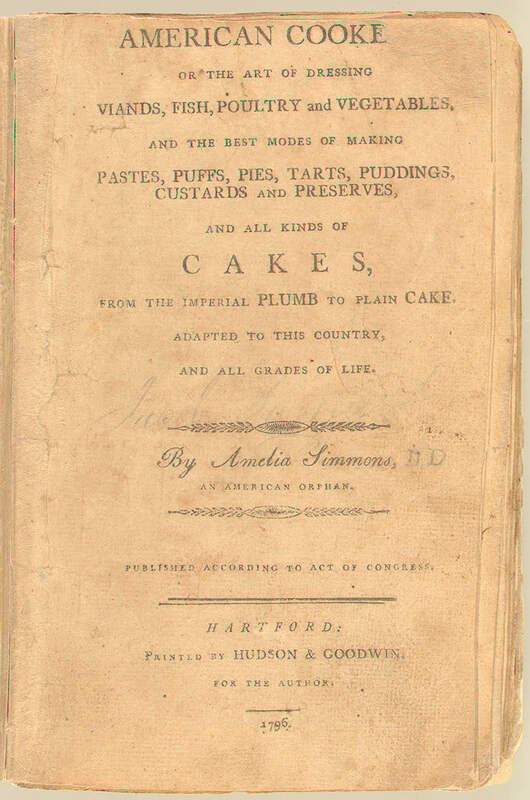 It was the most popular American book of its time; by 1837, it had sold 15 million copies, and 60 million by 1890—reaching the majority of young students in the nation’s first century. Its royalty of a half-cent per copy was enough to sustain Webster in his other projects. It also helped create the popular contests known as spelling bees. Webster’s Speller was entirely secular by design, undoubtedly based on his dissatisfaction with his own schooling. There was no mention of God, the Bible, or sacred events. “Let sacred things be appropriated for sacred purposes,” he wrote. He was intensely religious, especially later in life, but sacred and secular were different realms for him. Webster’s educational agenda concerned as much the creation of a unified American national culture that would stave off the decline of republican virtues and solidarity, as instilling good grammar and spelling. Following theorists such as Maupertuis, Michaelis, and Herder, Webster believed that a nation’s linguistic forms, and the thoughts correlated with them, shaped individuals’ behavior. Thus, the etymological clarification and reform of American English promised to improve citizens’ manners and thereby preserve republican purity and social stability. Lofty ideals !! In 1806, Webster published his first dictionary, A Compendious Dictionary of the English Language. In 1807 Webster began compiling an expanded and fully comprehensive dictionary, An American Dictionary of the English Language. It took 26 years to complete. Webster hoped to standardize US speech, since citizens in different parts of the country used different dialects and languages. Consequently they spelled, pronounced, and used English words differently. Though it now has an honored place in the history of American English, Webster’s first dictionary sold only 2,500 copies. He was forced to mortgage his home to develop a second edition, and his life from then on was plagued with debt. The work was so poorly received at first because Webster, as was his wont in everyday life, managed to annoy everyone. Culturally conservative Jeffersonian Federalists (whom he allied with much of the time) denounced the work as radical—too inclusive in its lexicon and even bordering on vulgar, while his old foes, the Republicans, attacked the man, labeling him mad for such an undertaking. 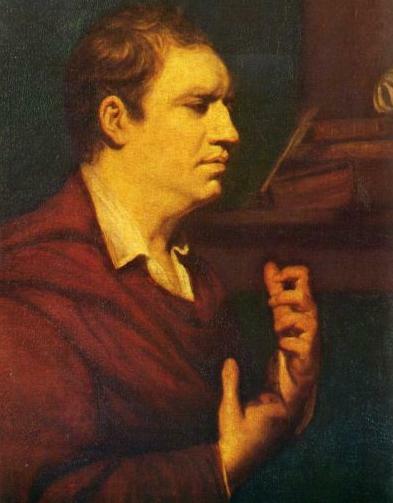 Even before he published the dictionary they called him “a pusillanimous, half-begotten, self-dubbed patriot,” “an incurable lunatic,” and “a deceitful newsmonger … Pedagogue and Quack.” But even Federalist rivals called him “a toad in the service of sans-cullottism,” “a prostitute wretch,” “a great fool, and a barefaced liar,” “a spiteful viper,” and “a maniacal pedant.” He certainly knew how to get up people’s noses. On the other side of the coin, Emily Dickinson saw the 1844 Webster’s as essential reading. She once commented that the “Lexicon” was her “only companion” for years. As it happens, Webster was one of the founders of Amherst college along with Dickinson’s grandfather, and she went to college with Webster’s granddaughter. Webster’s dictionaries helped redefine US national identity in an era of extreme cultural flexibility. Webster himself saw the dictionaries as a nationalizing device to separate the US from Britain, calling his project a “federal language” endeavor, with competing forces towards regularity on the one hand and innovation on the other. 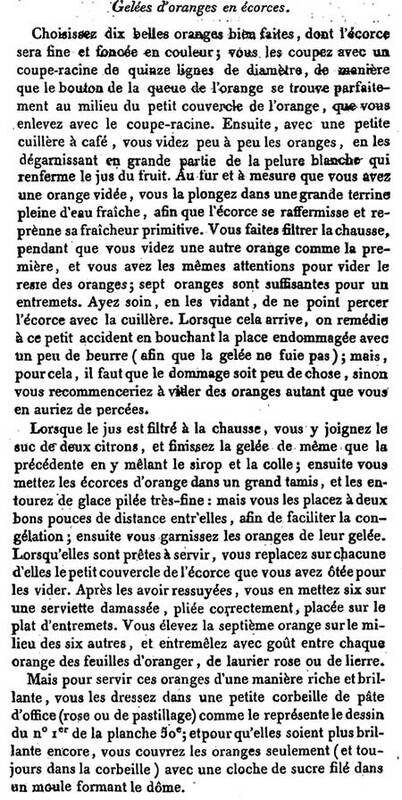 1784, September 29. Rode to West Division with Mrs. Fish to buy peaches. Returned and had dinner at Mr. Pratt’s. We ate Sea-Turtle. I don’t know how the turtle was cooked, nor do I want to cook one myself, but here’s a recipe from Simmons. Fill a boiler or kettle, with a quantity of water sufficient to scald the callapach and Callapee, the fins, &c. and about 9 o’clock hang up your Turtle by the hind fins, cut of the head and save the blood, take a sharp pointed knife and separate the callapach from the callapee, or the back from the belly part, down to the shoulders, so as to come at the entrails which take out, and clean them, as you would those of any other animal, and throw them into a tub of clean water, taking great care not to break the gall, but to cut it off from the liver and throw it away, then separate each distinctly and put the guts into another vessel, open them with a small pen-knife end to end, wash them clean, and draw them through a woolen cloth, in warm water, to clear away the slime and then put them in clean cold water till they are used with the other part of the entrails, which must be cut up small to be mixed in the baking dishes with the meat; this done, separate the back and belly pieces, entirely cutting away the fore fins by the upper joint, which scald; peal off the loose skin and cut them into small pieces, laying them by themselves, either in another vessel, or on the table, ready to be seasoned; then cut off the meat from the belly part, and clean the back from the lungs, kidneys, &c. and that meat cut into pieces as small as a walnut, laying it likewise by itself; after this you are to scald the back, and belly pieces, pulling off the shell from the back, and the yellow skin from the belly, when all will be white and clean, and with the kitchen cleaver cut those up likewise into pieces about the bigness or breadth of a card; put those pieces into clean cold water, wash them and place them in a heap on the table, so that each part may lay by itself; the meat being thus prepared and laid separate for seasoning; mix two third parts of salt or rather more, and one third part of cyanne pepper, black pepper, and a nutmeg, and mace pounded fine, and mixt all together; the quantity, to be proportioned to the size of the Turtle, so that in each dish there may be about three spoonfuls of seasoning to every twelve pound of meat; your meat being thus seasoned, get some sweet herbs, such as thyme, savory, &c. let them be dryed an rub’d fine, and having provided some deep dishes to bake it in, which should be of the common brown ware, put in the coarsest part of the meat, put a quarter pound of butter at the bottom of each dish, and then put some of each of the several parcels of meat, so that the dishes may be all alike and have equal portions of the different parts of the Turtle, and between each laying of meat strew a little of the mixture of sweet herbs, fill your dishes within an inch an half, or two inches of the top; boil the blood of the Turtle, and put into it, then lay on forcemeat balls made of veal, highly seasoned with the same seasoning as the Turtle; put in each dish a gill of Madeira Wine, and as much water as it will conveniently hold, then break over it five or six eggs to keep the meat from scorching at the top, and over that shake a handful of shread parsley, to make it look green, when done put your dishes into an oven made hot enough to bake bread, and in an hour and half, or two hours (according to the size of the dishes) it will be sufficiently done. 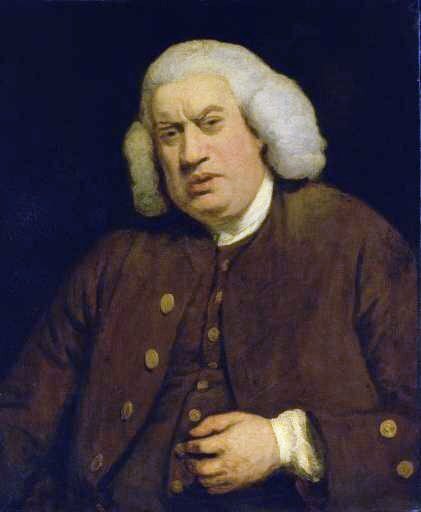 Today is the birthday (1709) of Samuel Johnson, English writer who made lasting contributions to English literature as a poet, essayist, moralist, literary critic, biographer, editor, and dictionary writer. Johnson was born in Lichfield, Staffordshire and attended Pembroke College, Oxford for just over a year, before his lack of funds forced him to leave. After working as a teacher he moved to London, where he began to write for The Gentleman’s Magazine. His early works include the biography The Life of Richard Savage, the poems “London” and “The Vanity of Human Wishes”, and the play Irene. 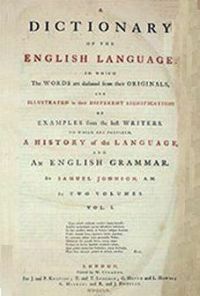 After nine years of work, Johnson’s A Dictionary of the English Language was published in 1755. 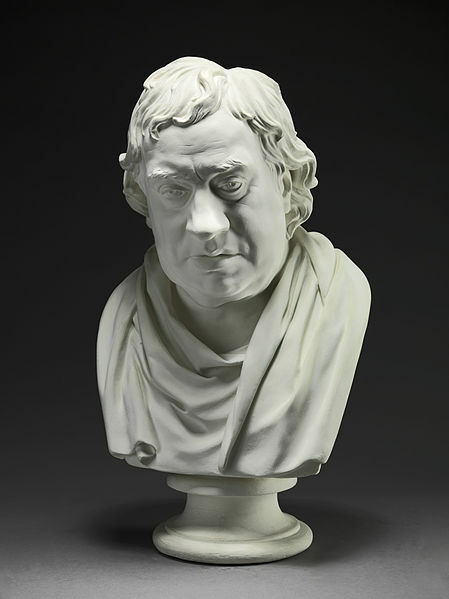 It had a far-reaching effect on Modern English and has been described as “one of the greatest single achievements of scholarship.” This work brought Johnson popularity and success. Until the completion of the Oxford English Dictionary 150 years later, Johnson’s was viewed as the pre-eminent British dictionary. Johnson’s later works included essays, an influential annotated edition of William Shakespeare’s plays, and the widely read tale Rasselas. In 1763, he befriended James Boswell, with whom he later traveled to Scotland, which he described in A Journey to the Western Islands of Scotland. Towards the end of his life, he produced the massive and influential Lives of the Most Eminent English Poets, a collection of biographies and evaluations of 17th- and 18th-century poets. Johnson had a tall and robust figure. His odd gestures and tics were confusing to some on their first encounter with him. 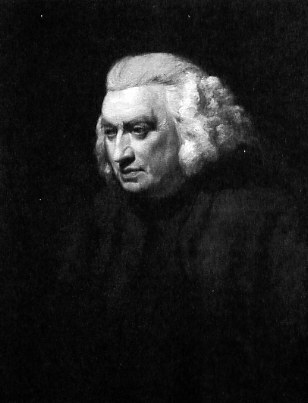 Boswell’s biography, Life of Samuel Johnson, documented Johnson’s behavior and mannerisms in such detail that they have led to a posthumous diagnosis of Tourette syndrome, a condition not recognized in the 18th century. After a series of illnesses he died on the evening of 13 December 1784, and was buried in Westminster Abbey. In the years following his death, Johnson began to be recognized as having had a lasting effect on English literature and language. I’d like to focus on two aspects of Johnson’s life. First, his time at Pembroke College for no other reason than that I went to Pembroke as an undergraduate where he was lionized. His tea mug sat on a plinth in the senior common room. Second, I’d like to ramble on a bit about his dictionary. 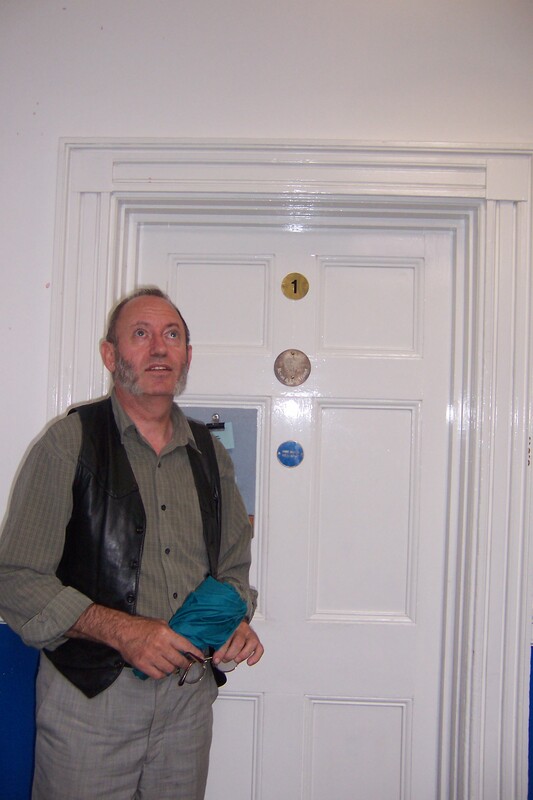 Outside my old rooms at Pembroke. 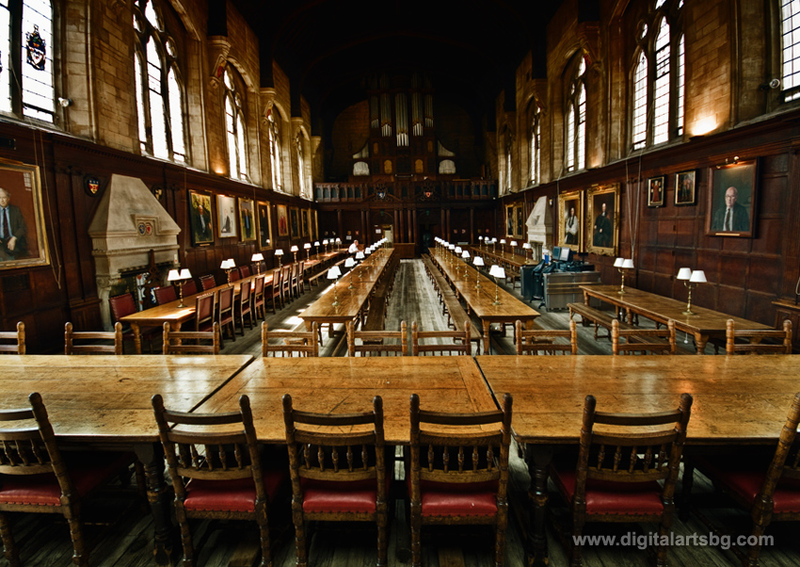 On 31 October 1728, a few weeks after he turned 19, Johnson entered Pembroke College, arriving on horseback from Lichfield with over 100 books. He had a small inheritance from one of his mother’s cousins that covered part of his expenses for the first year. Andrew Corbet, a friend and fellow student at Pembroke, offered to make up the deficit. Even so, after 13 months lack of funds led him to leave and seek work. His limited time at the college was the source of a great many stories when I was an undergraduate. His uneven study habits were well known, for example, and his former room, a garret in the entrance tower, was still being used by undergraduates. Even in the 1970’s it was considered an undesirable location. 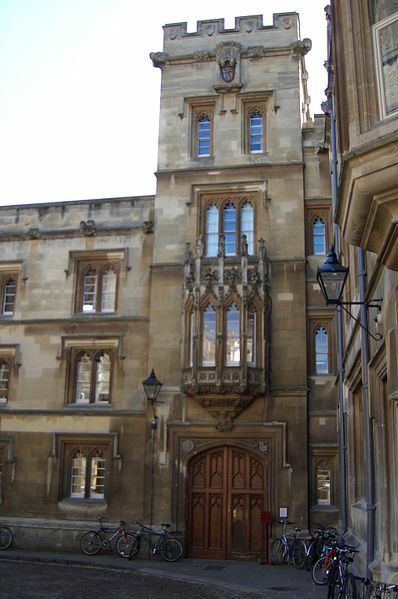 The photograph below shows the location (top floor).
. . . the success of Johnson’s scholarship – even by the age of nineteen – was apparently evident within the first few hours of him being in the college. Here his weight of learning was confirmed not only by the consignment of books he had brought with him (which all had to be deposited in the garret-like room at the top of a tower where he would live), but also by his willingness to introduce the subject of Macrobius into conversation when in the rooms of his tutor, William Jordan, together with a number of other undergraduates and Fellows in October 1728. Familiarity with Macrobius, a 5th C Latin writer and philosopher, was by no means part of the expected intellectual background of a student who was about to begin a degree. It was, as Robert Adams (later master of Pembroke but then a young Fellow of the College), a defining moment which clearly – and very swiftly – established Johnson as, ‘the best qualified of any undergraduate to be admitted to the university’. A glorious academic career seemed about to materialise. Why it didn’t – and why Johnson was being fined within his first week in the college (for truanting from his tutor’s lectures who was ‘no scholar’ as Johnson promptly judged him) is a different – and perhaps a more interesting story. To study, as Johnson later revealingly noted, is both ‘to think with very close application’, as well as ‘to muse’ -while one definition suggests diligence and industry, the other conveys something less focussed, if equally thoughtful in other ways. The life of a commoner student at Pembroke, very definitely required the former – discipline, rigour, consistent application and performance. Modern students might indeed be appalled at the requirements Johnson had to meet, beginning with compulsory prayers at six in the morning (and a fine if you were absent), and followed immediately by classes and study until breakfast at eight; on Monday, Wednesdays, and Fridays, this was followed by compulsory classes in Natural Philosophy. One of the essay titles set during Johnson’s time at Pembroke was the undoubtedly improving one – at least in precept and intention — of ‘Get up early if you want to write a good essay’ – the good essay in question moreover had to be written in fluent and impeccable Latin, and publicly declaimed in the college hall, in front of all the other undergraduates and fellows. Weekend is not a word recorded in Johnson’s dictionary – indeed, a weekday, in the customs of the 18thC is, as Johnson does note ‘any day except Sunday’. True to form here then, the working week in Pembroke in fact began on Saturday, and it was on this day when the declamations of the week’s essays took place – in Latin, and in the Hall. It was to be something which could torment Johnson’s sense of academic worth. For example, he always had to make sure he was out of ear-shot when the highly able Meeke – later a Fellow of the College – declaimed. The sense that Meeke excelled more than he did could provoke the torments of rivalry – and the depressing sense of failure (and in turn the ‘melancholy’ which Johnson would of course suffer at times throughout his life). Johnson’s life at Pembroke was something of an enigma. On the one hand, he clearly read widely and produced brilliant work. For example, he was asked by his tutor to produce a Latin translation of Alexander Pope’s Messiah as a Christmas exercise. Johnson completed half of the translation in one afternoon and the rest the following morning. It later appeared in Miscellany of Poems (1731), edited by John Husbands, a Pembroke tutor, and is the earliest surviving publication of any of Johnson’s writings. On the other hand, he was frequently fined for not attending compulsory lectures, and was known for reading just about everything except the assigned readings. He could also be found often in the college gate entertaining other “loungers” with his wit instead of studying. It is usually remarked that Johnson left the college after 13 months, penniless, with broken shoes and shabby clothes. But this is not really the whole story. 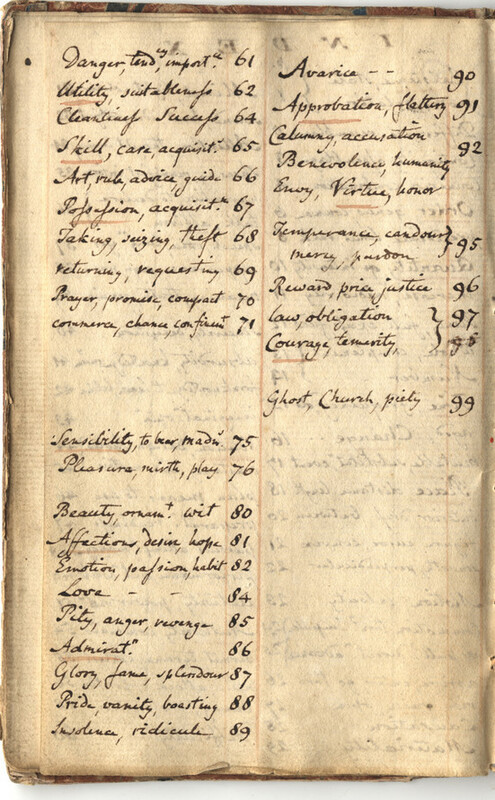 The college battel books, accounts of student expenditures on food and drink (still keep in ledgers by hand in my day), show that Johnson constantly lived well above the average means, with no apparent concern for his dwindling funds. Furthermore, he need not have left when the money ran out. There were menial positions that he could have accepted, such as servitor, which would have required him to shave and dress the richer students and wait on them at meal times, but which would have paid his way. Johnson’s pride, however, coupled with his embarrassment at his social position would not allow him to do this, and so he left, leaving behind most of his books as a sign that he intended to return. 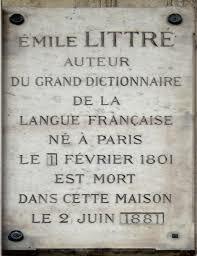 He was eventually awarded a degree after the publication of his dictionary. His dictionary may be his most widely known work. In 1746, a group of publishers approached Johnson about creating an authoritative dictionary of the English language; a contract with William Strahan and associates, worth 1,500 guineas, a substantial sum, was signed on the morning of 18 June 1746. Johnson claimed that he could finish the project in three years. 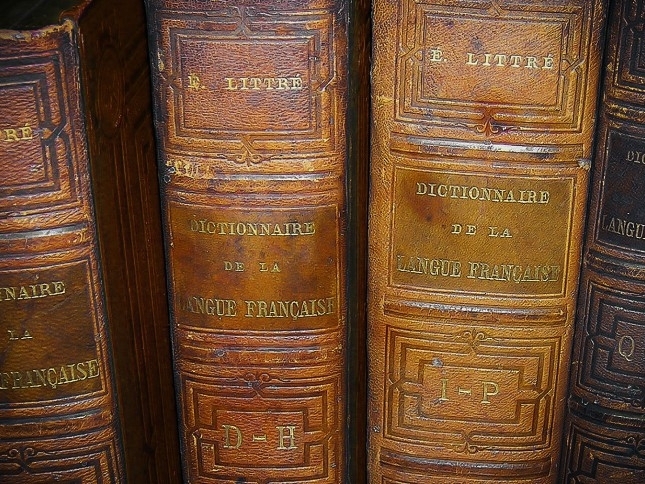 In comparison, the Académie Française had forty scholars spending forty years to complete its dictionary, which prompted Johnson to claim, “This is the proportion. Let me see; forty times forty is sixteen hundred. As three to sixteen hundred, so is the proportion of an Englishman to a Frenchman.” Although he did not succeed in completing the work in three years, he did manage to finish it in nine, justifying his boast. 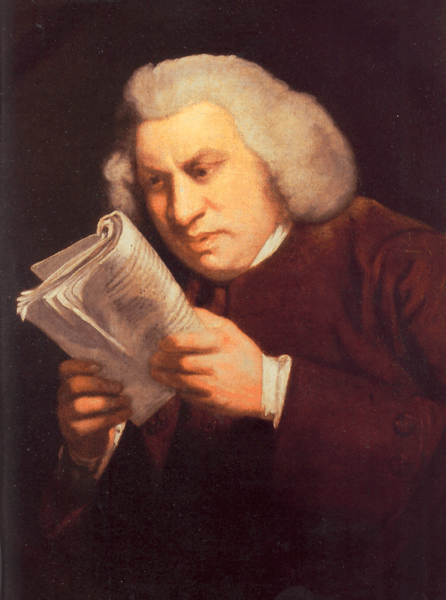 Johnson’s dictionary was not the first, nor was it unique. It was, however, the most commonly used and imitated for the 150 years between its first publication and the completion of the Oxford English Dictionary in 1928. Other dictionaries, such as Nathan Bailey’s Dictionarium Britannicum, included more words, and in the 150 years preceding Johnson’s dictionary about twenty other general-purpose monolingual English dictionaries had been produced. However, there was open dissatisfaction with the dictionaries of the period. In 1741, David Hume claimed: “The Elegance and Propriety of Stile have been very much neglected among us. We have no Dictionary of our Language, and scarce a tolerable Grammar.” Johnson’s became the definitive English dictionary. Cough: A convulsion of the lungs, vellicated by some sharp serosity. Distiller: One who makes and sells pernicious and inflammatory spirits. Whig: The name of a faction. Because of his universally well known definition of oats I have decided to include a recipe that features oats: apple crumble. This is a “pudding” that my mother made often on Sundays when I was a boy, and which I loved. It is great hot served with hot custard, and equally wonderful cold the next day with lashings of heavy cream. It has become very popular in England in recent years, but restaurants tend to make it much too fancy with, what I consider, unnecessary ingredients. 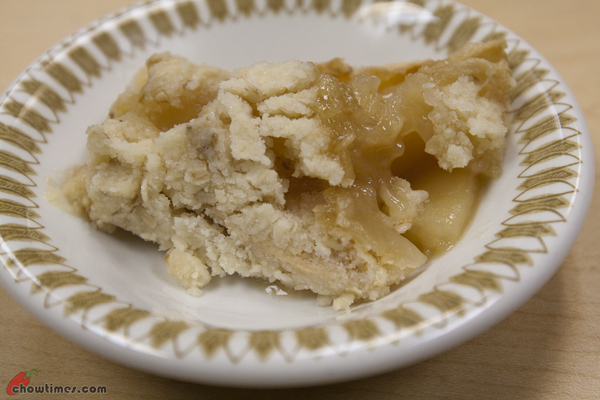 A perfect apple crumble is nothing more than baked, sliced, sweetened apples topped with a generous layer of crisply browned oats, flour, sugar, and butter. You can use brown sugar for the apples and toppings, but I find that white sugar produces a cleaner taste, with no added spices or seasonings of any sort. I am going to give you my, tried and true, recipe from memory, and so it will not be in conventional recipe form, but in basic ratios. I use a 12x6x6 inch rectangular casserole (given to me on my 21st birthday by my best friend when I was at Pembroke). I stack layers of peeled, cored, and sliced baking apples in the casserole until it is ¾ full, sprinkling a small amount of sugar on each layer as I go. The topping I make in a food processor using a ratio of two parts oats, two parts all purpose flour, 1 part white sugar, and 1 part butter (chilled and coarsely diced). I pulse the mix until it is evenly mixed (maybe 8 to 10 pulses). I use enough so that the topping will spread evenly over the apples and mound slightly higher than then top of the casserole (it will shrink in baking). Dot the top with butter. Put on the middle rack of a pre-heated 375°F oven until the apples are merrily bubbling and the topping is browned evenly. I have no idea how long this takes – maybe 40 minutes. Serves 1 in my house. I do not have my own picture but this one comes close. My topping is a little browner and coarser.